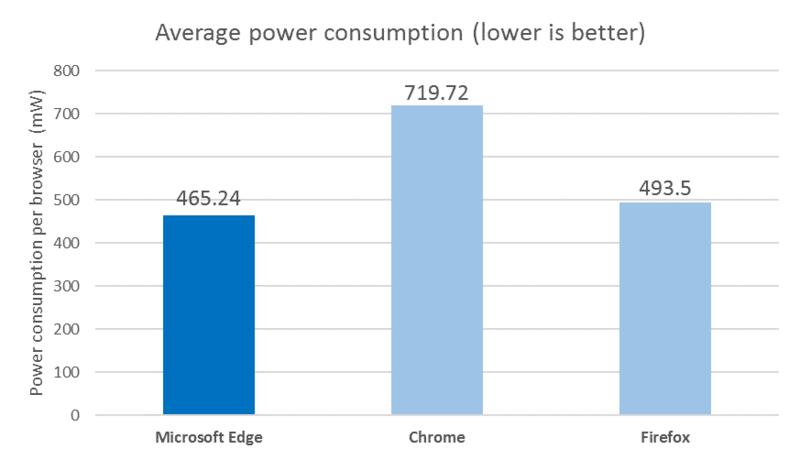 Microsoft Edge is the best performing, Google Chrome the worst performing web browser when it comes to battery life performance according to Microsoft. If you are using a laptop or tablet for some of your computer-related activities you are probably aware that browsers may have a big impact on battery life. While it depends on use of the browser when using the mobile device, it is clear that the choice of browser may impact battery life by hours rather than minutes. 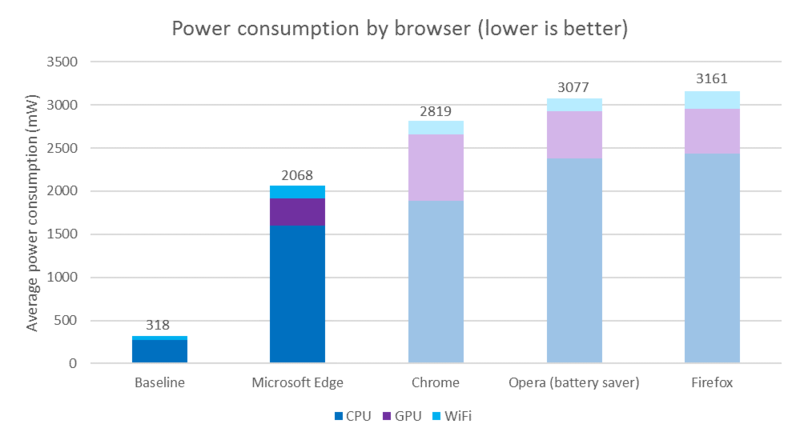 Opera introduced a new power saving mode in the web browser recently that promises to improve battery performance significantly when it is used. Microsoft too has been working on improving battery performance of the company's Edge browser, and conducted a series of studies and tests to highlight that. To understand the impact, we compared today’s leading browsers across three independent dimensions. First, we measured their power consumption in a controlled lab environment. Second, we examined the real-world energy telemetry from millions of Windows 10 devices. Finally, we recorded time-lapse videos of each browser performing the same tasks until the battery dies. The four browsers Microsoft Edge, Mozilla Firefox, Google Chrome and Opera faced off against in each playing streaming video non-stop on Microsoft Surface Books using the same configuration. Microsoft Edge came first in the test with a battery time of 7:22 hours followed by Opera with 6:18 hours, Firefox with 5:09 hours and Google Chrome with 4:19 hours. The company notes that Opera's battery saving mode was enabled for the test, and that the latest versions of each browser were used. We streamed the same high-definition video wirelessly on each device and set up a video camera to record the laptops until each one died, noting the time when each device stopped playing. Microsoft Edge latest three hours longer than Google Chrome, Opera two hours longer than Google Chrome, and Firefox 50 minutes longer. Microsoft did look at aggregated telemetry data from millions of Windows 10 devices to find out more about power consumption. According to the inforamtion, Microsoft Edge and Mozilla Firefox use on average 465 and 493 mW while Google Chrome a staggering 719 mW. Surface Books and all four major browsers were used in the final test again. Microsoft connected a Surface Book to specialized monitoring equipment and measured "typical browsing activities" by spending time on Facebook, Google, YouTube, Amazon or Wikipedia reading articles, opening websites, watching videos or opening new tabs. Edge did best again while Chrome came in second this time, Opera third and Firefox fourth. A test conducted by Microsoft that highlights that Microsoft Edge is more power optimized than other browsers needs independent verification. But that is only possible of the test setup is known. For instance, which versions were used, and did Microsoft keep all default preferences or modify some? Now You: What's your experience in regards to power consumption and browsers? Between Firefox and Chrome, Firefox. The difference is huge, fans on my laptop even stop spinning while using FIrefox, meanwhile with Chrome it heats up too much to consider it comfortable to keep it on my lap. I don’t know about IE, but I think it’s probably in between, more towards Firefox..? Maybe. And I have no desire to ever use Edge, or the OS that it is tied to. After Chrome last update this weekend, I can stream Amazon Prime for five hours without overheating. I will never use Edge for browsing until I can install uBlock Origin on it. Ads shown while browsing with Edge are excessive. Dedoimedo also ran some tests recently. Well, I mean Edge is still pretty barebones even against vanilla Chrome and Firefox installations. So no surprise here. with features comes more resource usage, which means more power consumption. so, since edge does not even supports a single add-on, ofc it consumes less. it also does not has all the features the other browser have, like plugins for example. Of course, Windows itself will drain the battery life of your laptop faster than, say, Chrome OS (Linux kernel); so my chromebook keeps chugging along all day. We know (according to the video) that the video, and laptops are the same… We are led to believe that the only difference is the browser. These claims in performance seem a bit bold. The browsers are all using the same codec/decoder? If no, that is a big factor right there. If they are, I would like to see a comparison in picture quality (looking at artifacts, such as ringing and aliasing). There are also little “tweaks” they could use to change these results. An example I can think of, would be gamma adjustment. One being just a bit brighter could have a significant impact on run time, when comparing hours. I’m not claiming that this test isn’t legit, but the difference seems too great for what we are told. What are your thoughts, Martin? Oh Pulease! Edge takes a long time to open on my laptop – – SO I DON’T Use it!!! noscript beats em all hands down. Also, create your own custom power profile for windows. Edge works great for me but LastPass is not yet available on stable builds. I started using Firefox after years with Chrome because I could put the zoom buttons on main bar (and also, I find Firefox aesthetically much pleasing compared to Chrome). After the anniversary updates I will see if Edge feels good enough to replace the flexible Firefox. DirtectWrite flag has been removed from Chrome and fonts look blurry even with clear type adjusted. Bye Chrome, Hello Edge. Assuming that you install ad-blockers in all, should not this level the play field again? I agree that you get better results when you install blockers though. – How important is battery life on laptops ? 8 hours is long enough, most people I know would only very occasionally have a use for one extra hour. – How important is browser battery consumption on mobile, especially with blockers, versus apps and system, background updates and stuff ? – Aren’t people using a website’s native app instead of the browser when they want a power consuming service like video, social network or gaming ? Just trying to gauge the weight one should give to battery life benchmarks VS other browser concerns.